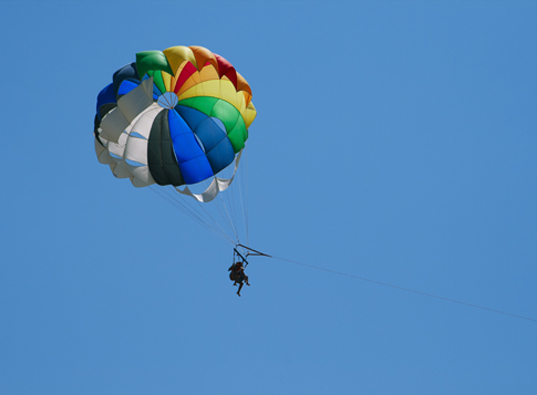 Parachuting, or skydiving, over the years has undergone tremendous technological and performance enhancements. Be it, as a source of recreational activity or competitive sport, or used for the deployment of airborne forces and supplies by the military, or for emergency landing, parachuting has come a long way. Safety being a crucial factor, various innovations in terms of material specifications and designing has taken place to ensure a smooth and safer landing. During storage, the base fabric of the parachutes tends to decay from mold and fungus. The moisture condensed on the substrate deforms/damages the parachute membrane thereby rendering the parachutes extremely unsafe. The parachutes normally get wet after the jump because water vapour condenses on the fabric of the chutes. The damp fabric provides a breeding ground for fungus and mold growth. The military, where there is frequent usage of parachutes for training of personnel, is faced with the problem of decay of parachute fabric during storage. The conventional method of parachute drying was to hang them from hooks in huge rooms with high ceiling and fans. The process was not only time consuming but did not entirely free the parachutes from moisture, which invariably remained trapped in the folds. Bry-Air desiccant dehumidifiers ensure the parachute drying and storage areas are free from condensation, mold and fungus. They surround the parachutes with continuous dry air and ensure strict environment control to prevent fungal growth and decay of the fabric.